Tonight was a very lazy night, and I did not intend to make dinner at all. However my husband went shopping and brought home a very fresh chicken, and I thought it was a shame not to cook it right away. The whole concept for the chicken was a very fortunate accident, an improvisation, I only wanted to make a quick dinner, so that I can be done ASAP and finish reading “Inferno” by Dan Brown (OMG., I love the suspense, but the book is a bit weaker than the”Lost Symbol” not to mention the “Da Vinci Code”) . 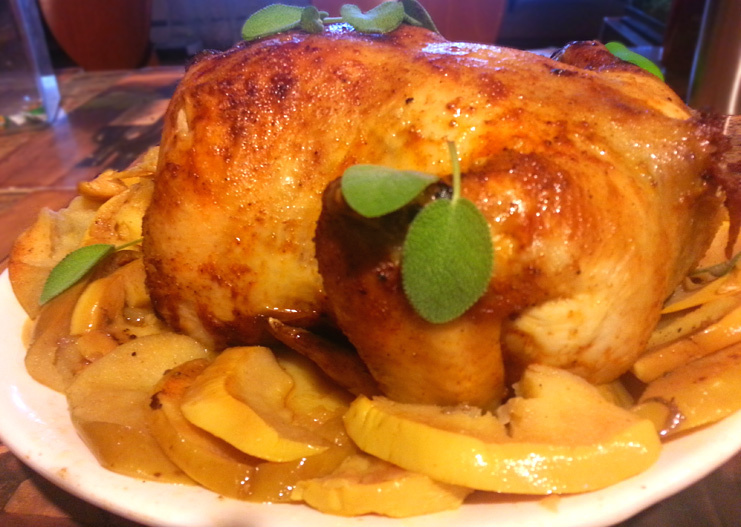 Where was I?, Oh yeah, the chicken; I decided on a roast chicken – it’s easy, I won’t have to stand over the stove, and I would have time to finish a chapter or two while it’s cooking. And so I seasoned the chicken with “Feiney’s Original BBQ rub” (http://www.feintastingfoods.com) and placed the chicken into a preheated to 425F oven for 15 minutes, to get the skin nice and crispy. While the chicken was in the oven I reached for an apple to snack on, and my eye gaze fell on a lonely quince that was intended for a fruit punch. I thought that I might as well bake the apple and quince for dessert. 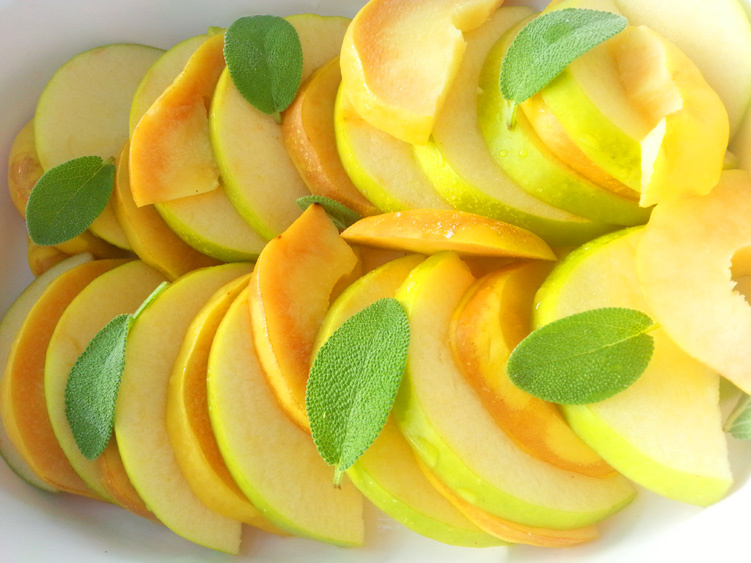 I sliced the apple and quince into thick slices, blanched the quince for 5 minutes in about 3/4 cup of water. As I placed the apple and quince slices into a baking dish, the timer on the oven rang to reduce the temperature for the chicken, and that’s when I was abducted by aliens got inspired and grabbed my phone (to take pictures, I got to step up and use a real camera). 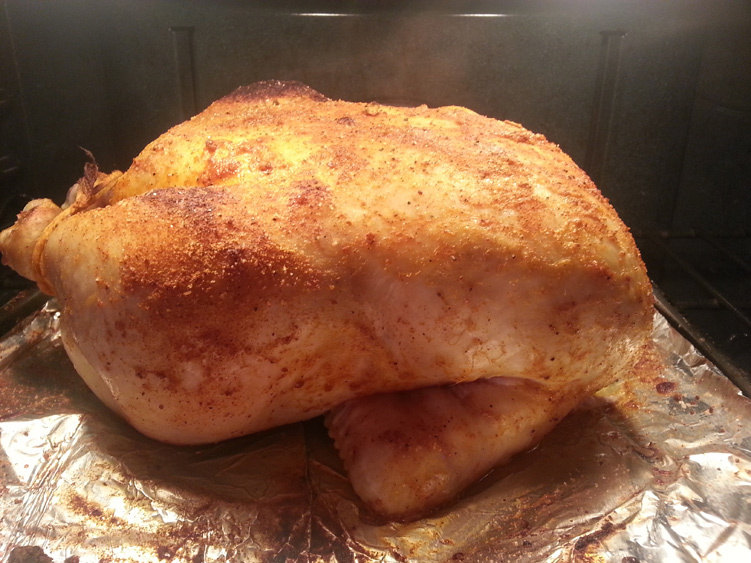 Preheat oven to 425 F (218 C), season the chicken inside and out with seasoning blend and place the chicken in the oven for 15 minutes. Check from time to time, to make sure the skin doesn’t burn. Place apple and quince slices into a baking dish, pour wine and the blanching liquid from the quince into the dish, add sage leaves, and sprinkle the fruit with salt(so that the fruit will release the juices). Reduce the oven temperature to 325F (163C), place the baking/roasting dish into the oven, and finally grab that book and read for about an hour. 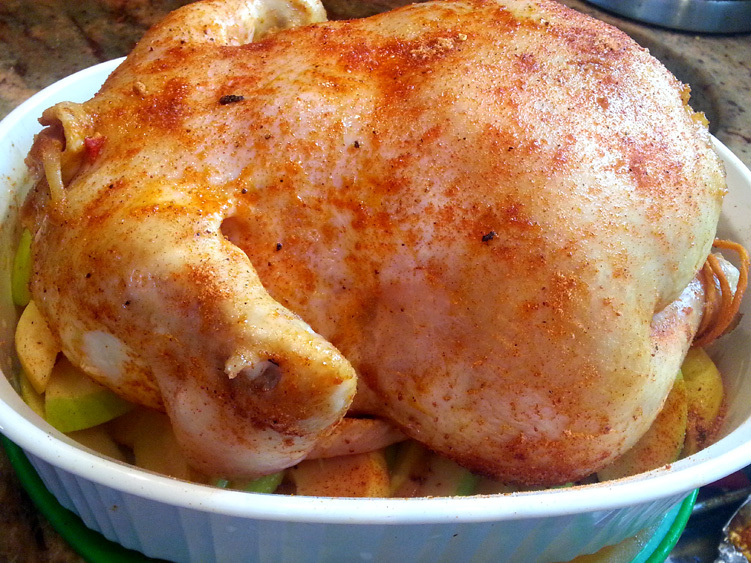 Remove the chicken from the oven and place it on a serving dish, arrange apple and quince slices around the chicken. Start fighting off family with a stick, so that they can’t steal a piece before the dinner is served.